Play an important role in many different types of ecosystems. · the indiscriminate killing of snakes by people who fear or dislike them. Many harmless snakes, and even legless lizards, are killed unnecessarily in this way. A number of snake species have been listed as threatened in NSW. All native snakes in NSW are protected under the National Parks and Wildlife Act 1974. Snakes aren’t normally aggressive and will only bite when provoked or hurt. 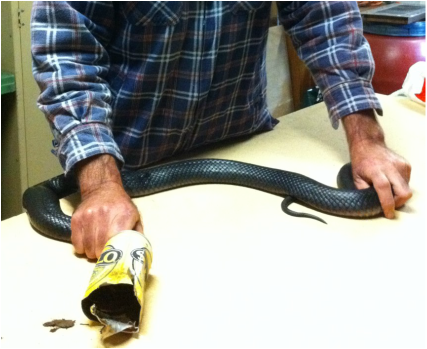 Wildlife Rescue South Coast suggests if you see a snake, leave it alone and walk away. · When bush walking always wear appropriate shoes and stay on the designated walking tracks. Removing a RBB snake stuck in a drink can © WRSC Belinda Gales and Phil Donovan. If you find a snake entangled in discarded netting or trapped e.g. caught in a can as in the photo above, please ring Wildlife Rescue South Coast or your local wildlife rescue group immediately. Only trained handlers can rescue snakes especially venomous snakes. Do not put yourself or anybody else at risk, remove and restrict domestic pets and if possible observe from a distance, an elevated position is the safest viewpoint, so the injured snake can be easily located when the handler arrives. Snakes are reptiles, which mean they are ectothermic: they get their body heat from external sources. Endothermic animals, such as mammals and birds, regulate their body temperature internally. A snake's body temperature - and so its level of activity - is controlled by the temperature of the air and the ground. It will try to maximise body heat by basking in the sun or lying on or near warm surfaces such as night-time roads or even, on occasion, household water heaters. In cold areas of the state, snakes hibernate during winter. However, in the more temperate climate along the coast they shelter in rock crevices and logs during cold weather and come out on warm days to soak up the heat of the sun. During cold weather, snakes are less active and therefore hunt less. In the winter their metabolisms slow down, and they use up body fat which has been stored up during the warmer months of the year.